Zumba Fitness® is the only Latin-inspired dance-fitness program that blends red-hot international music, created by Grammy Award-winning producers, and contagious steps to form a “fitness-party” that is downright addictive. Since its inception in 2001, the Zumba program has grown to become the world’s largest – and most successful – dance-fitness program with more than 12 million people of all shapes, sizes and ages taking weekly Zumba classes in over 110,000 locations across more than 125 countries. 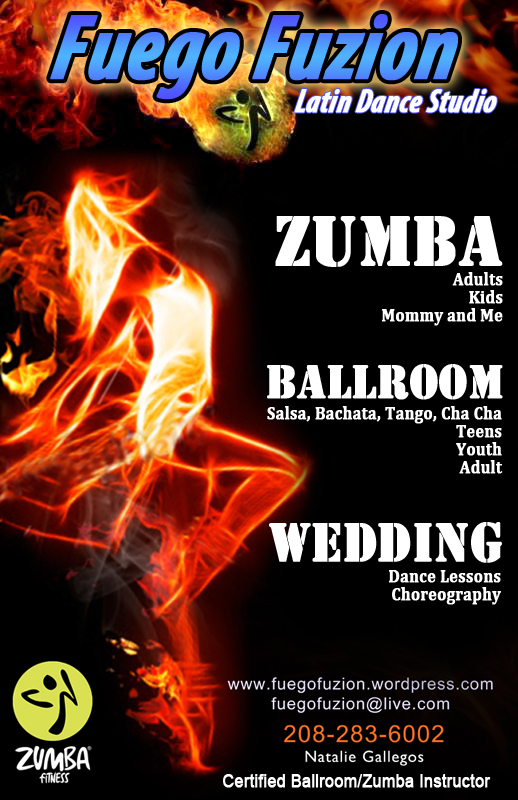 Natalie Gallegos is a Certified Latin Dance and Zumba Fitness instructor. She was trained and certified through the Fred Astaire Dance Studios in 1999 to teach and compete in dances such as Tango, Salsa, Merengue, Rumba, Samba, Cha-Cha, Waltz, Foxtrot and Swing. She has experience in university level social dance instruction, performance preparation, theater choreography for adults and youth, large group instruction and private lessons. Natalie’s instructing abilities as well as her love and passion for dance have helped her create original choreography for countless events in the treasure valley.